← Sure, it got the Yankees a ring, but what else does $423.5 million buy? It’s Randy Andre “Moose” Milligan day in Baltimore. Twenty one years ago today, on Nov. 9, 1988, the Orioles acquired Milligan from the Pittsburgh Pirates for a player to be named later, who turned out to be Peter Blohm. Milligan played four seasons in Baltimore. He hit for a .258 average, with 59 home runs, and 228 RBI. More impressive, he maintained a .388 on-base percentage. 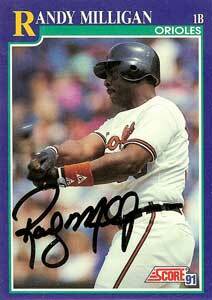 Milligan slugged a career high 20 home runs in 1990. Blohm, meanwhile, never advanced beyond the Triple-A level. Milligan emerged as a central figure in the Birds’ Why Not? season. His game-tying three-run homer at Fenway Park on Aug. 2, 1989 is a key highlight from that magical year. The clout helped the Orioles avoid a four-game sweep in Boston and extended the team’s lead over the then-second place Red Sox to two games. Like many O’s fans, I have a soft spot for the Moose. Among other factors that made him so likable to me, Milligan hit a batting practice home run that landed in my teenage hands at Memorial Stadium. It’s one of only two baseballs I caught as a kid. The other came off the bat of the Milwaukee Brewers’ Dante Bichette. Here are some appreciations for Milligan from the blog-O’s-phere: Camden Chat, Orioles Card “O” the Day, Birds in the Belfry (an outstanding chronicle of the ’89 season).